Katy Depot on the Texas Western Narrow Gauge Railroad that stretched from Sealy to Houston. Image available on the Internet and included in accordance with Title 17 U.S.C. Section 107. 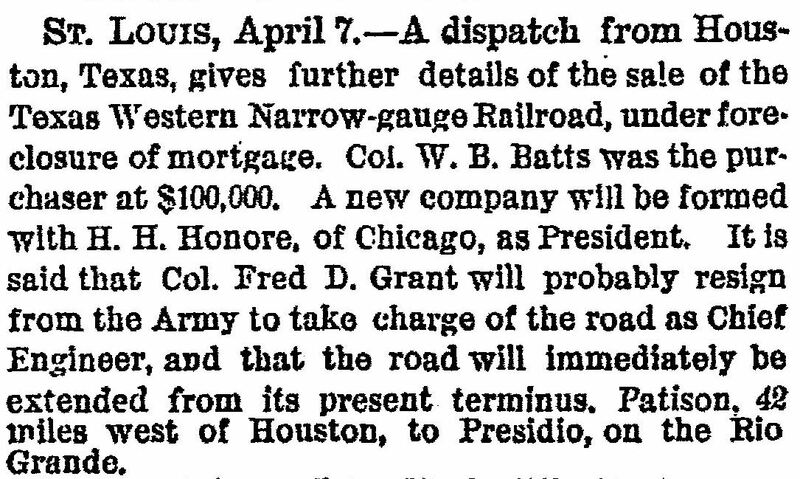 A New York Times article about the foreclosure of the Texas Western Narrow Gauge Railway, 1881. Courtesy of the New York Times. Image available on the Internet and included in accordance with Title 17 U.S.C. Section 107. TEXAS WESTERN RAILWAY. The Texas Western Railway Company was chartered on April 28, 1881, as a reorganization of the Texas Western Narrow Gauge Railway Company. It was one of three railroads in Texas chartered with the name "Texas Western." The other companies were chartered on the same day in 1852; one was never built and the other eventually became a part of The Texas and Pacific Railway Company. The railroad was originally promoted by I. S. Roberts, Thomas W. House, Thomas H. Scanlan, Eugene Pillot and others of Houston as the Western Narrow Gauge Railway Company on August 4, 1870. This company was, by a few days, the first narrow gauge railroad chartered in Texas. As originally conceived, the railroad was to build from Houston to San Antonio via Bellville, La Grange, Lockhart and New Braunfels along with a branch from La Grange to Bastrop. In addition, the Western Narrow Gauge could also build from New Braunfels down the Guadalupe Valley to connect with any railroad building from the Gulf Coast. Although the company created considerable interest along its proposed route, sufficient financial support was not forthcoming. On February 6, 1875, the charter was amended to change the name of the company to the Texas Western Narrow Gauge Railway Company. The amended charter also gave the company the right to build west so "as to cross the Rio Grande at or near Presidio del Norte." The promoters planned eventually to continue the line across Mexico to Guaymas, on the Gulf of California. In addition, the charter granted authority to construct a branch line from some point in Caldwell or Hays county to the northwestern border of Texas and there to connect with the Denver and Rio Grande Railway Company. Texas Western Railway Map. Image available on the Internet and included in accordance with Title 17 U.S.C. Section 107. 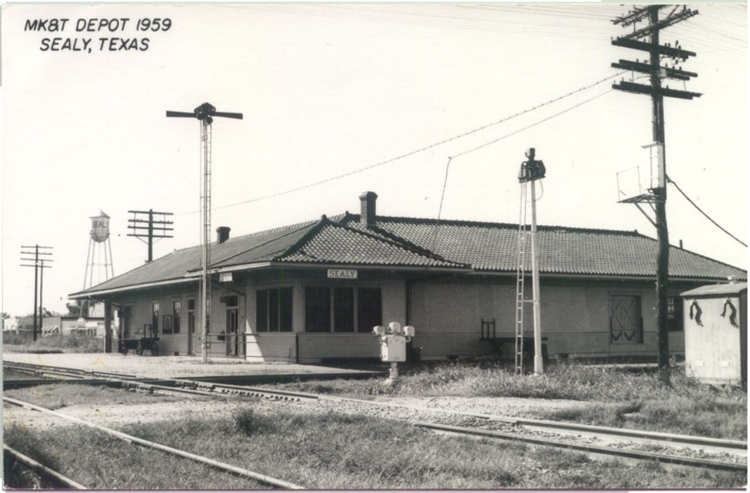 Missouri, Kansas and Texas Depot in Sealy. Image available on the Internet and included in accordance with Title 17 U.S.C. Section 107. 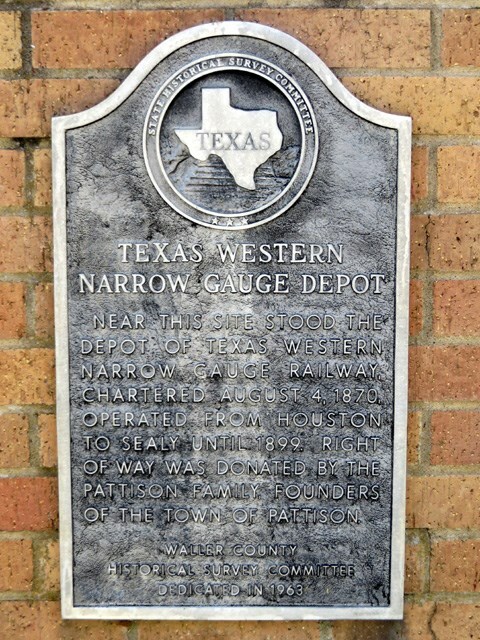 Texas Western Narrow Gauge Depot Historical Marker in Pattison. Image available on the Internet and included in accordance with Title 17 U.S.C. Section 107. Although ground was broken in 1872, actual construction did not begin until early 1875, and the first locomotive arrived around the first of March. The initial ten miles opened with an excursion on July 3, but it took another year for the second ten miles to be completed, and it was not until April 23, 1877, that the railroad opened for the forty-two miles between Houston and Pattison. At that point members of the Pattison family donated 150 acres for the development of a terminal. To handle its traffic the Texas Western Narrow Gauge had two locomotives, fifteen freight cars, and one passenger car. Within two years the railroad was in financial trouble and was reorganized as the Texas Western Railway Company. At this time former president Ulysses S. Grant became interested in the project and became a member of its board of directors, while his son, Frederick D. Grant, was named president of the company. In 1882 the railroad was able to bridge the Brazos River and completed a ten-mile extension to Sealy, where a connection was made with the Gulf, Colorado and Santa Fe Railway Company. However, due to the difference in track gauge between the two companies, the Texas Western was unable to interchange cars. The railroad went back into the hands of the court on July 2, 1884, when a receiver was appointed for the company. A receiver's sale, held on May 5, 1885, was approved by the court on November 25. Although the property was transferred to Elijah Smith of New York, the railroad remained in the hands of a receiver due to a lawsuit in Federal Court to determine the rights of the various alleged owners of the company. In 1887 the receiver made an unsuccessful attempt to extend the Texas Western at least as far as Cat Springs, twelve miles west of Sealy. The fate of the narrow gauge was sealed in 1893 when the Missouri, Kansas and Texas Railway Company of Texas (Katy) built into Houston along the projected route of the Texas Western. The Katy line between Sealy and Houston paralleled the Texas Western and crossed the narrow gauge three miles south of Pattison. The Texas Western was sold in 1895 with Elijah Smith again the purchaser. It appears that the railroad did not operate after June 30, 1896, although it was not abandoned until 1899. The rails were removed by June 30, 1900, and the land at Pattison reverted to the Pattison family. Handbook of Texas Online, George C. Werner, "TEXAS WESTERN RAILWAY," accessed April 21, 2019, http://www.tshaonline.org/handbook/online/articles/eqtpg.